For several decades, food packaging has made handling food easier and helped to maintain its quality. Plastic packaging possesses the advantage that it is light and flexible, with a vast variety of polymer modifications allowing a wide range of usages. However, during the manufacturing process and the storage of such packaging materials, smaller molecular chains or rings are formed which, due to their molecular size of less than 1,000 Dalton, are able to migrate from the packaging into the food. In order to show compliance with regulations, the oligomers must first be identified and their concentration in the food determined. The small chains of molecules are called oligomers (the Greek word oligoi meaning “few” and méros “part”). In particular polyester packagings produced from different kinds of monomers contain numerous different oligomers . Polyethylene terephthalate (PET), for example, contains cyclic (c) and linear (l) oligomers of different sizes . In addition to terephthalic acid (TPA) and monoethylene glycol (MEG), the monomers used for its production, the oligomers in PET also contain an additonal monomer, diethylene glycol (DEG), which is presumably formed under the high temperatures of the polymerization process . The oligomers of polyesters such as PET, polybutylene terephthalate (PBT) and polyethylene naphthalate (PEN) which are composed of at least two different monomers, are designated as follows: a monomeric oligomer consists of a diacid and a dialcohol, a dimeric oligomer consists of two diacid and two dialcohol units, and so on. 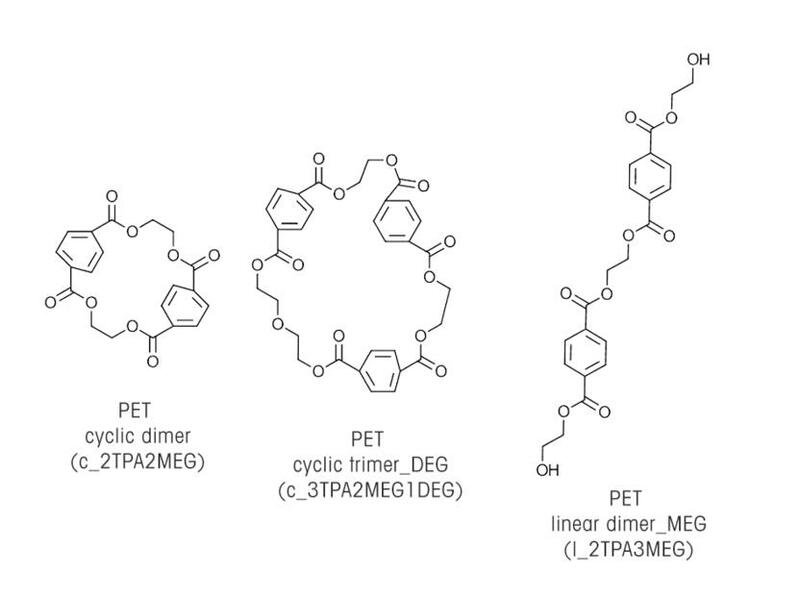 Typical chemical structures of the oligomers found in PET are shown in Figure 1. There are several methods for identifying and characterizing oligomers present in polyesters. One of the most common is extraction of the oligomers using a suitable solvent, often dichloromethane, and analysis of the extract by liquid chromatography coupled with high-resolution mass spectrometry (LC-HRMS, liquid chromatography – high resolution mass spectrometry) (Fig. 2). Knowing the monomers of which the tested polyester consists and generating high-resolution, accurate mass spectra allows to assign individual signals to possible oligomeric structures. For the evaluation, a software program which calculates possible molecular formulas can be used. MS/MS experiments can also lead to additional data or confirm a possible structure if the detected mass fragments can be assigned. Due to the lack of oligomer standards, however, a comparative analysis can often not be carried out. The lack of standards also complicates the quantification of oligomers in polyester extracts or migration solutions. As a workaround, a commercially available substance that is structurally similar to the oligomers to be quantified is often used because isolating the individual oligomers from an extract solution by means of preparative gel permeation chromatography (GPC) is very time-consuming, and synthesizing them even more so. 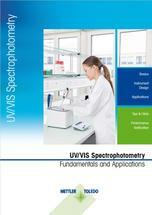 Semi-quantification or quantification is carried out using LC-MS or HPLC-UV. 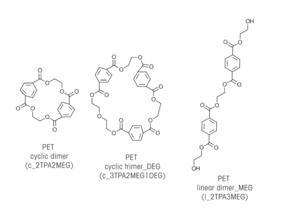 Several scientific groups are working with the cyclic PET trimer, which has been commercially available for several years. It is assumed to generate the same MS response as oligomers [4, 5]. 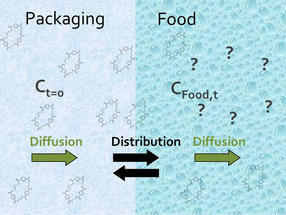 The diffusion of substances from food contact material into the food is called migration (Fig. 3). This is a diffusion-driven process, with smaller molecules migrating faster than larger ones because of their higher diffusion coefficients. Migration also depends on the solubility of the substances in the packaging material and in the food, the interaction between the packaging and food, and contact duration. The diffusion coefficient, in turn, depends on the temperature. 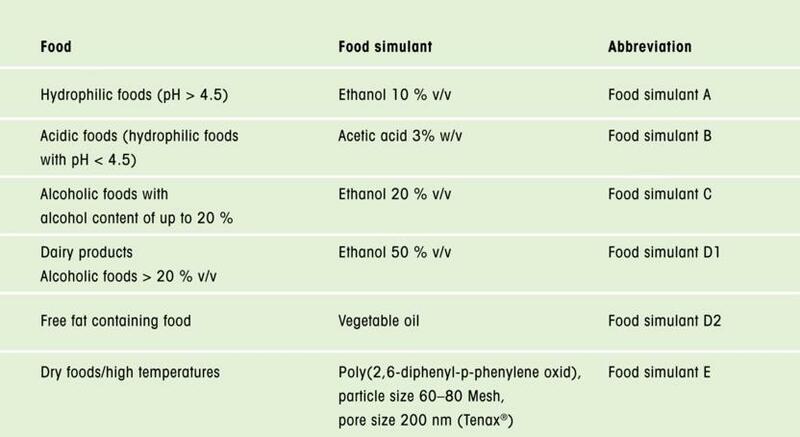 In order to study the migration of substances such as oligomers in a simplified and standardized way, the European Union’s Regulation (EU) No 10/2011  introduced a set of food simulants (e.g. 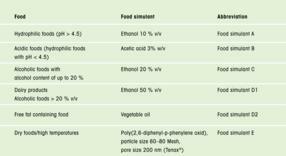 ethanol 10 %, 50 % and 95 % (v/v), acetic acid 3 % (w/v) and vegetable oil) which correspond to a particular food type and are assigned to these (Fig. 4). Likewise, contact duration and temperature, simulating certain storage conditions, have been defined. This allows for analyses without interfering matrix effects caused by food constituents, making the results more comparable. 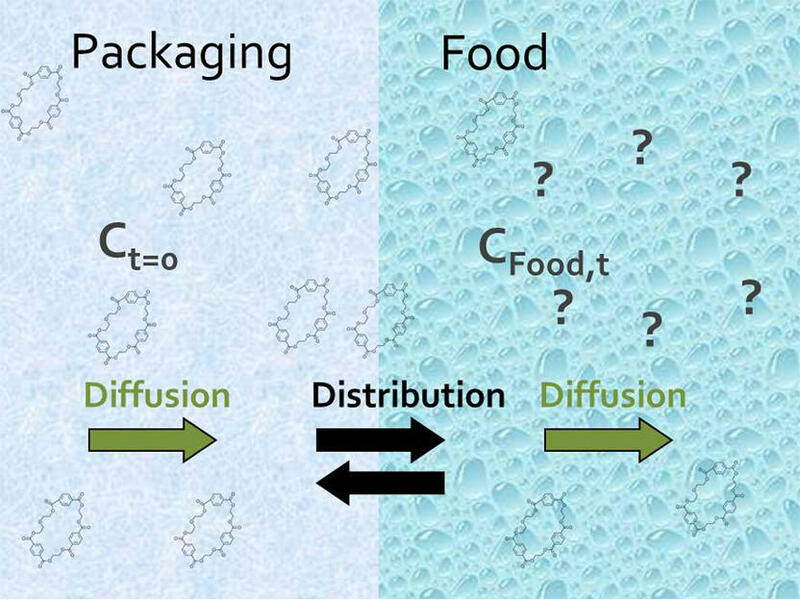 Oligomers from polyester-based food packaging have been much discussed and debated in recent years by both the European Food Safety Authority (EFSA) and the EU with respect to their occurrence and their migration behavior. For the migration of the oligomers of polyethylene furanoate (PEF), polybutylene terephthalate (PBT) and polyesters containing 2,4,8,10-tetraoxaspiro[5,5]undecane-3,9-diethanol,β3,β3,β9,β9-tetramethyl contained as a monomer, it was concluded that “this substance (the respective monomer) does not raise a safety concern for the consumer when … migration of the oligomers less than 1,000 Dalton does not exceed 50 μg/kg food” [7, 8]. Although a migration limit has not yet been determined for the oligomers of other polyesters, the above value is considered a guidance level for structurally similar polyesters. Whether or not the stipulated migration level is observed can be determined by means of migration studies or mathematical modeling. Oligomers are present in polyesters because they are inevitably formed during the polymerization process and the further processing of the polymer for packaging. Although their concentration can be reduced by post-polymerization processing steps, complete conversion to higher molecular weight chains does not take place. Oligomers of less than 1,000 Dalton, which migrate from packaging material into food, can potentially be absorbed by the human digestive tract and are thus receiving ever greater attention in the assessment of packaging materials. Legislative revisions at the EU level in 2016 pertaining to the oligomers of two polyesters have increasingly led to oligomers of already approved packaging materials being investigated for their migration properties, and initial steps have been taken to toxicologically classify them. To do this, it is useful to study the hydrolysis of oligomers in simulants that mimic the human digestive tract. This could help to determine whether the oligomers are broken down to the respective monomers during digestion, thus requiring no toxicological evaluation of their own. In addition, a variety of oligomer standards is needed to evaluate proposed quantitative and semiquantitative methods or even to conduct toxicological studies to test for statutory migration limits.